Last week my husband and I strolled along Martin Place to see the rest of the Vivid sculptures and light show. 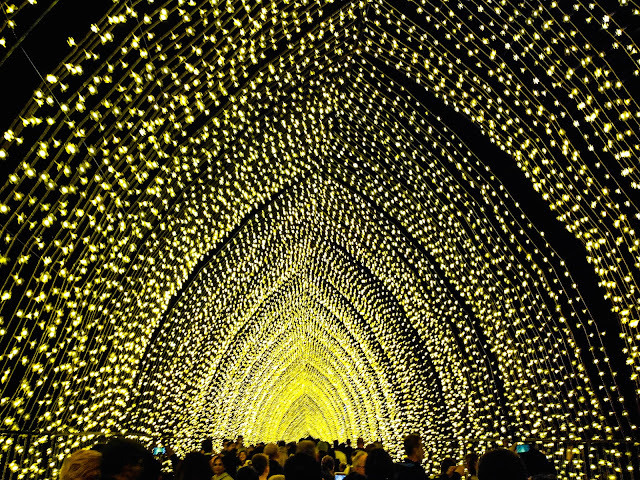 It is the first time the heart of Sydney CBD had become an integral part of Vivid. Martin Place was the location of the final fight between Neo and Agent Smith in The Matrix Revolutions. After finishing our 10 km Spit to Manly walk, we took a ferry from Manly Warf to Circular Quay, and then walked from there to Martin Place. Winter evenings are quite windy in Sydney. I clutched to my jacket and along with other people, who had slowly started gathering around the sculptures, eagerly waited for the clock to strike 6. And then just like that, the whole area lit up with green light beams across buildings and trees, mist hanging in the air and lovely music playing in the background. I have never seen Martin Place look this colorful and dreamlike. I hopped around the green lights, while my husband tried to capture my Shrek like avatar. Sky Flower was conceived by studying and then amalgamating the forms of a variety of winter flowers. The artistic intention was to develop a work that envelops the space around it and draws you in from afar. On a clear night, you can see the light output produced by Sky Flower from several miles away; the piece is designed to act like a beacon, calling out for people to travel into the city to experience the bright lights of Vivid Sydney. The giant luminiscent dome that you see below is called the Geo Glow Dome. The installation transforms a structural object into a 3D surface, which you can walk in and around, and manipulate and control. 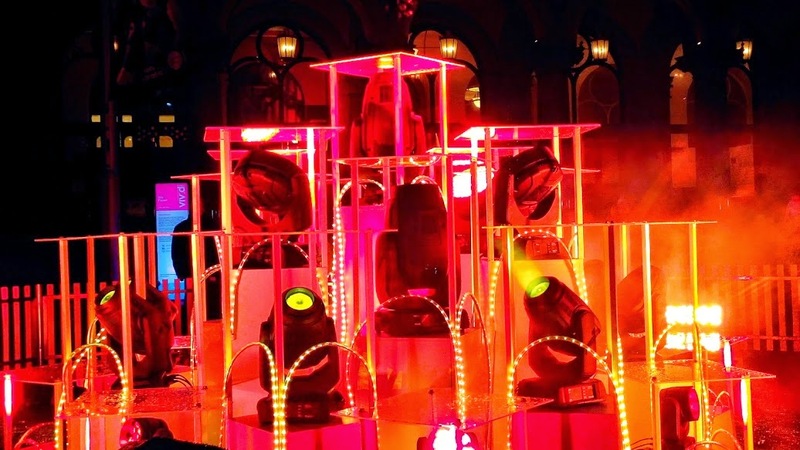 Using simple touch-screen controls, you and a friend can control the lights on the entire dome – one of you can change the colour and intensity, and the other can manipulate masking and effect. 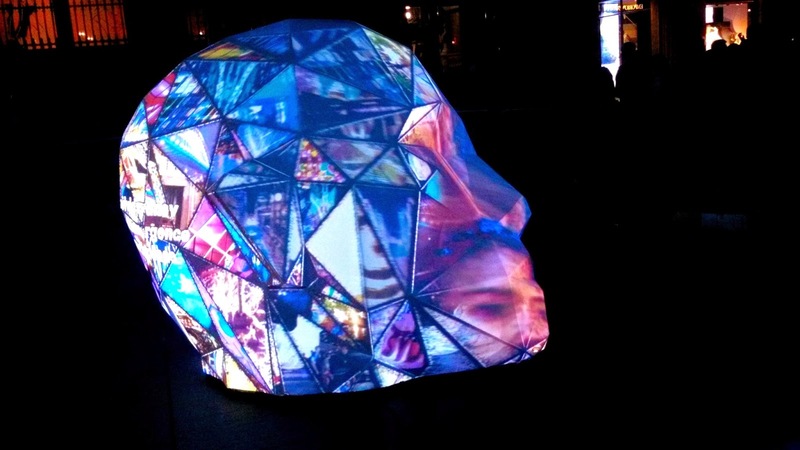 People in Martin place must have noticed this Giant Head sculpture called e|MERGEnce. You can actually lend your face to it. What intrigued me most was Water fountain. Initially I thought that a continuous stream of water was flowing (Like a waterfall) and the trick was done by light. But that wasn't the case. The shape is formed by water. Here's a gif I made for better clearity. It looked absolutely marvellous. Absolutely WOW! Stunning images there! But can't help wondering how much electricity is actually used to do all these installations? Super shots. I felt the excitement. Your pictures are so vivid, it's like being there. That giant head sculpture is really weird. I can't decide if I like it or just find it creepy.